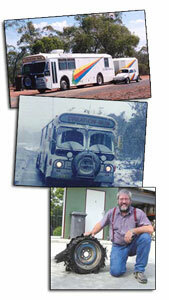 Creation Bus retired from faithful service. With a looming international financial crisis, CMI has felt it necessary to do some substantial financial belt-tightening in the interests of good stewardship. This required a review of the whole ministry including the Creation Bus. It has been an incredible 17 years ministering with “Myrtle” (our pet name for the bus) all over our land, but reality impels us to draw this chapter of the ministry to a close. For a short while it seemed as if the Lord had provided a way to circumvent this, but that was not to be. And seemingly confirming the decision, we have recently learned that Cathy’s mum requires full time care and has moved into our home. Being free of the bus has enabled Cathy, a registered nurse, to take on that responsibility. The bus was originally conceived by Carl and me as a means of enabling me to “stay out there” for long periods of time without being separated from my wife and family. I will be seeking other employment, either full or part time, but will continue to minister through CMI whenever the need arises. Thanks to all who have supported the bus ministry in so many ways over the years. It could not have achieved what it did without your faithfulness and generosity. Cathy and I are confident that your support for the ministry will continue and we ask for your prayers as we enter a new phase in our service for the Lord. Note from Carl Wieland: Anyone who sees the DVD of Peter’s talk at the January 2009 Supercamp (available April 2009) will know what an amazing ministry effort this has been. Thanks, Peter and Cathy, for your faithful service all these years. If you or anyone you know is interested in purchasing from CMI a mobile home with superb mechanicals, please contact the Brisbane office. 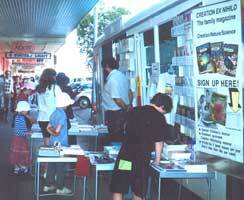 CMI-Australia’s Creation Bus ministry has been one of the most remarkable and effective outreaches conducted by creation ministry anywhere in the world. For over 17 years, husband and wife team Peter and Cathy Sparrow ministered to regional, rural and outback Australian communities that might normally have missed out on the type of ministry that the major centres take for granted. 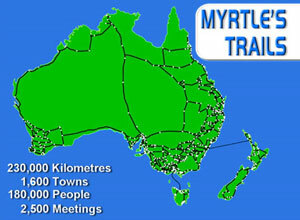 From rainforests to deserts, from mountain heights to coastal plains, through everything from blistering heat to blinding snow they travelled over 200,000 kms across the length and breadth of Australia to minister to over 100,000 people in over 1,000 towns. 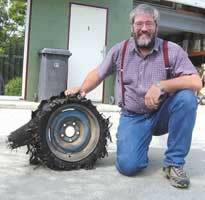 Peter with a shredded trailer tyre. Peter has given over 1,500 creation talks during this time, making him perhaps the most experienced speaker that CMI has. Peter is a trained science teacher with a degree in biology, and is also a licensed builder; Cathy is both a Registered Nurse and an experienced secretary, who now is a fulltime home carer for her ailing mother. The bus, affectionately known as Myrtle (the turtle), was a completely renovated former South Australian public transport bus. It served as a mobile home for Peter and Cathy while they were on the road, sometimes for months at a time. It had a bedroom, bathroom, a small lounge/kitchen area, and even a dedicated workstation for Peter and his computer. 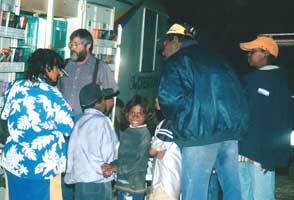 Large doors opened out on the side of the bus to reveal storage for CMI’s life-changing resources which were disseminated into the far reaches of this great ‘sunburnt country’. Covering such enormous distances and difficult terrain brought its share of mishaps and potentially dangerous situations, too. Peter lost count of the number of blown tyres and ‘middle of nowhere’ repairs he dealt with over the years. As the large size of the bus made it impractical to ‘pop down the road for a loaf of bread’, they also had a car which was towed behind the bus in a fully enclosed trailer/workshop. For most of their ministry, this car was the Creation Bug. Purchased at remarkably low cost, it was basically a highly modified 1969 Volkswagen sedan, with Baja body styling and large tyres give it a ‘dune buggy’ appearance. Originally built for off-road racing, it had many ‘sports’ features and an 1800cc motor with full race cam, twin throat carburettor, Donaldson air cleaner and extractors. Such a noticeable vehicle led Peter and Cathy into many conversations and witnessing opportunities, which was ideal in small country towns where they could invite people along to their meetings. (Peter said, ‘When I rock up to a school in the Bug, the kids will listen to anything I have to say because anybody who drives that thing has to be “cool”.’) The bus had brightly coloured stripes down the sides, each colour representing a day in Creation Week, along with a picture of a dinosaur. Blue: day 2, water and sky. Yellow: day 4, sun, moon and stars. Brown: day 5, living creatures. Red: day 6, man (‘one blood’). 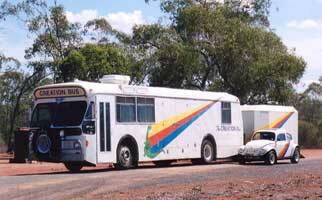 It was hard not to notice when the Creation Bus rolled into town, particularly with its ‘DAYS 06’ number plate! “ There is a time for everything, and a season for every activity under heaven.” Truly this was a ministry for its time in this sunburnt country.